Home » Archives » August 2005 » Poster for a MadMan... [Previous entry: "Tuesday is the day from ... hwo knows where !!!"] [Next entry: "Blogging internationally..."] 08/16/2005: "Poster for a MadMan..." listening to: TV in the next room, loveLine in the office. I apologize for the size of the image...but not really. If you click on it, it'll open up in a new window at "full" size. In reality it's a 23"x35" poster...so it won't be THAT big. Anyway. I am pumped about this poster. I think it's the best work I have done in a long long time. It's pro bono, of course, but that's how you get posters into your portfolio when you are trying to get poster work! 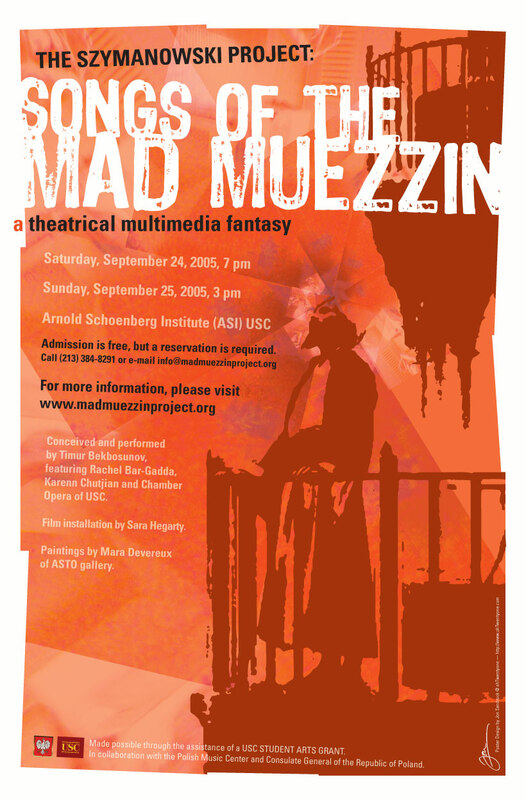 It's for an opera being performed at USC this September. On a secondary note, I am thinking about building an affiliate marketing site. I have read some interesting articles about people who make their living this way. It would be nice to get some checks in the mail. I am also thinking about building a site devoted to all those "Free iSomething" offers you see out there, in an attempt to generate traffic and eventually earn one of every free thingy that I can get. (iBook, iPod, iPod Shuffle, MacMini, etc...) It might be fun, and I see no harm in doing it. I'll make myself a new e-mail address for that, and if it gets slammed, I'll shut it down. No biggie. I also gave some thought about openning a CafePress shop today. I could sell copies of all the pro-bono posters I do, and maybe some obscene t-shirts and goofy clocks. However, you can only have ONE of each item on the CafePress free sites...so that idea is out unless I want to set up more than one store. So. That's my week thusfar. I hope you like the poster. This is really well done! I liked it so much I showed it to my assistant. Amazing. How did you achieve the texture on the white header font? I really like it. I'm sure if I played with the brushed I could do it... but wow. I also really like the rough border. If I had to ask one question or make one negative comment it would be the red "a" Was there a specific reason for making it red? It doesn't really bother me, but at the same time it's my least favorite part. Not that I have any part that isn't a favorite because this is exceptional. Is that dark font black or is it 90% gray? Wait...you have an assistant? I want an assistant! No fair! To answer your question, it's actually started out as a "retinal damage" orange/warm red thing...but when I layered in the background it got a little darker. However, I think it gives an accurate depiction of madness and dementia (two major themes of the opera) so, I left it that color. I didn't want to mess with it and lose the serendipity. I think, for most, it causes the desired emotional knee-jerk reaction. Oh yeah, that font is called 4990810, and the black CMYK color didn't make the trip to RGB very well, but it never does, depending on monitor calibration. Jon, I just wanted to tell you, while I'm putzing away time here at work, that this poster is wonderful! The colors work beautifully- they're so saturated, and I would not have known that the purple color thrown into the central part of the image could work so well. And the font is a perfect compliment to the tone of the piece - I love the look of aged, crusty, deteriorating surfaces...Is crusty an acceptable art term? *Give Joc a pinch for me.